Strucolo recipe put together elements of the cuisine of Istria, Austria and Italy; Friuli Venezia Giulia is a border region, for this reason it isn’t strange to find a traditional dish like this, which mix a name beyond the Alps and ingredients of Istria. Strucolo is a typical recipe of the Venezia Giulia and in particular of Trieste and Gorizia. It boasts a history tied with the weird origin of the name, a perfect example of contamination among different border cultures. The name Strucolo is, in fact, the Italianization of the Slavic word “strukllj”, which was the translation itself of the German word “strudel”. Actually a strudel version of Trieste exists, it is the Strucolo de Pomi, where there is a thin and crispy shell with a sweet stuffing made of apple and raisin. The resemblance with the famous apple dessert is not only for the name but also in the shape; Strucolo, in fact, is a roll of dough, with the stuffing, rolled on itself until it reaches the cylindrical shape. They differs for plenty of reasons: first of all the stuffing, which can be sweet or savoury, besides the cooking method. Savoury Strucolo is served, generally, as a first course and it enclose a stuffing of ricotta and cheese or vegetables as peas or spinach (the famous Strucolo de Spinaze), beef or veal meat; the sweet version can be stuffed with fresh or dried fruit and chocolate. In the karst area, next to Trieste, the Strucolo par excellence is filled with walnuts, raisin and breadcrumbs, and seasoned with melted butter and a pinch of cinnamon. This recipe comes from Istria and it became the Trieste traditional dish thanks to the exodus of people of Istria in Italy, becoming, for this reason a widespread and appreciated dessert. 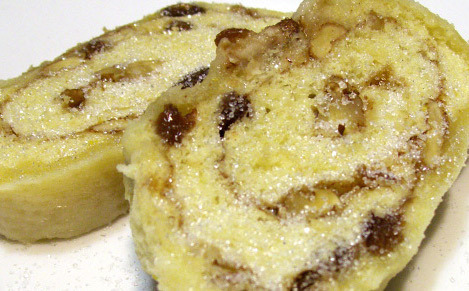 Strucolo is filled with grinded dried fruit, breadcrumbs and honey, then rolled and boiled. After being cooked in the water, it is cut in slices and seasoned with melted butter and powdered sugar, for the greediest it is delicious served with whipped cream. In the area of Gorizia, Strucolo experienced some changes: it is used, in fact, to mix to the dough also smashed potatoes, which make it similar to gnocchi. For this reason it is generally eaten in the savoury version stuffed with vegetables and meat, seasoned with melted butter and breadcrumbs or cheese. The Strucolo cooking has a peculiarity, it isn’t baked or cooked in a pot, but it is boiled slowly, just like gnocchi. The dough, once being stuffed and seasoned, it is rolled and closed with a “straza”, a dishtowel. The ends are closed with a thread and soaked in the boiling water, the result is the kuhani struklji: the boiled Strucolo. Once cooked it can be eaten like this or seasoned with butter, in the sweet version with sugar and cinnamon. It has fully entered the culinary heritage of Friuli Venezia Giulia given than it is a delicious dish, which is worth eating, both in the sweet and the savoury version.